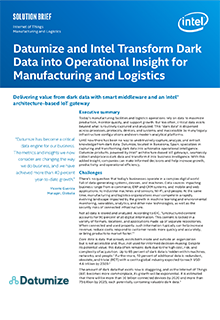 With Datumize and Intel, manufacturing and logistics organizations, as well as many other industries, can uncover the previously hidden data to support growth, reduce operating costs, increase productivity, and help achieve operational excellence. Datumize has created an innovative solution—powered by an Intel architecture-based IoT gateway—designed to recover dark data and transform it into relevant information that supports better manufacturing and logistics decisions. The Datumize and Intel solution provides the manufacturing and logistics industries with advanced metrics, dashboards, and alerts based on dark data that could not previously be accessed.